Cataract is the disease of the eye which causes blurred vision and causes clouding on the lens of the eye in the envelope or at the back of the iris. 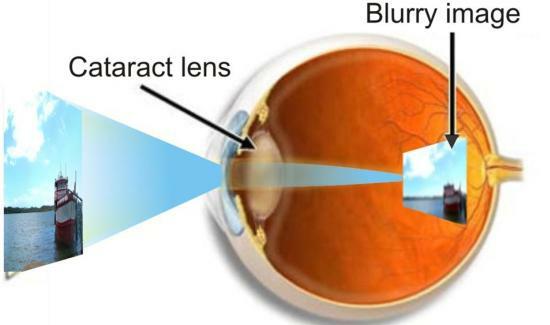 The lens can suffer from partial or complete opacity thereby obstructing light passage. Every individual is affected with cataract in some point of its life. Excess consumption of alcohol, salt, sugar, smoking, deficiency of vital vitamins and diabetes are some of the common factors responsible for cataract. If you also have cataract then there is no need to worry as there are several home remedies that help to cure cataract. Put some drops of honey into the eye. This will reduce the effect of the cataract. The same goes with castor oil, add some 2-3 drops of castor oil into the eye before going to bed at night. This is one of the best home remedies to treat cataract. Cardamom and milk is one of the best home remedies that help to cure cataract. Add two pieces of cardamom to boiled milk and drink it before going to bed at night. Eat 2-3 cloves of garlic or include them in your daily diet. Don?t swallow the pieces of garlic, just chew them slowly. Garlic is a good cleansing agent and cleans the crystalline lens in the eye. Take equal amount of coriander and aniseed and add some sugar to this mixture and take at least 12 grams of this mixture early in the morning. This is one of the proven home remedies for cataract. Eat more and more carrots. This is because; carrots are rich in Vitamin A, which is an essential component for healthy eyes. You can also drink carrot juice if you are not comfortable eating raw carrot. Take seven pieces of the kernel of almonds and add some half gram pepper and crush them together in water. Take this mixture daily. This is the best home remedies to treat cataract. Eat more and more vegetables such as cauliflower, fenugreek, drumstick, spinach and parsley. Also, eat more fruits such as dates, grapes, and oranges. All these are essential for keeping the eyes healthy. So if you are affected with cataract, just use these home remedies and get rid of cataract in the most natural and comfortable manner. Can you explain ‘Take seven pieces of kernel and add some half gram pepper and crush them together in water’ Kernel? It would be great to have testimonies about how these have worked for others. Thank you very much for pointing out. In fact its kernel of almonds. We have modified article. Soak five almonds in water over night and remove the skin in the morning. Along with peeled almonds, add five black pepper corns and one green cardamom in a glass of cow’s milk. Blend them in mixer adding little jaggery and drink on empty stomach before breakfast daily. Almond, black pepper and cardamom are good for eyes. Have pure castor oil prepared according to traditional dry roasting and crushing and boiling decantation method to remove any ricin poison and further boiling the oil to remove any impure scale formed one top. Apply 2 drops in each affected eye before going to bed. Morning remove the scrum using cotton bud and wash eyes thoroughly. Continue for 21 days and if needed for 90 days depending one severity. You will see results in 7 days though. 4. Take equal amount of coriander and aniseed and add some sugar to this mixture and take at least 12 grams of this mixture early in the morning. This is one of the proven home remedies for cataract.